LEGOLAND Water Park - Coming Soon! 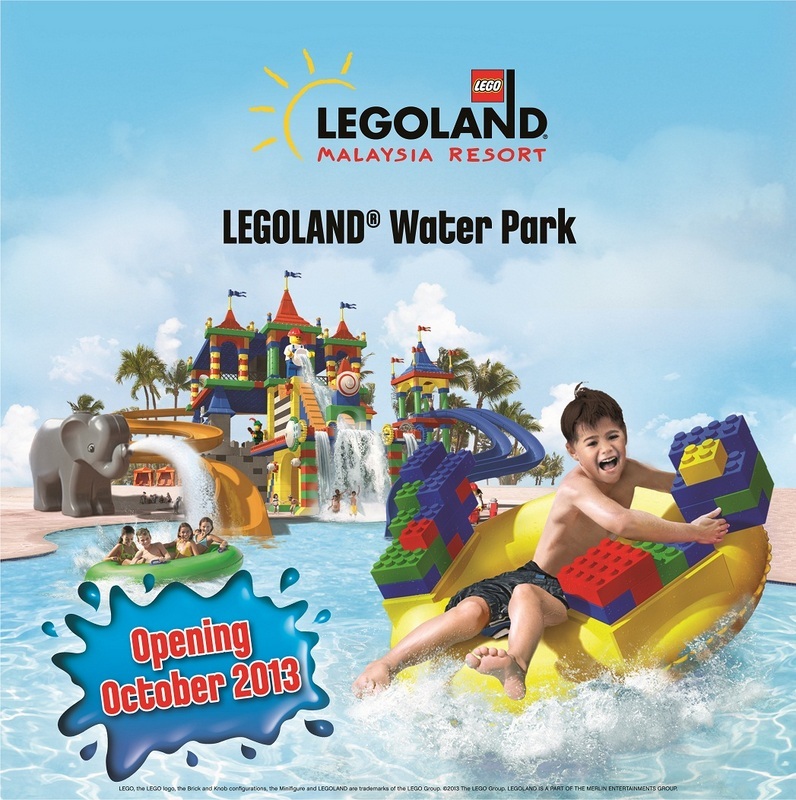 Better get those swimsuits ready, because LEGOLAND Water Park will be opening on 21 October 2013! 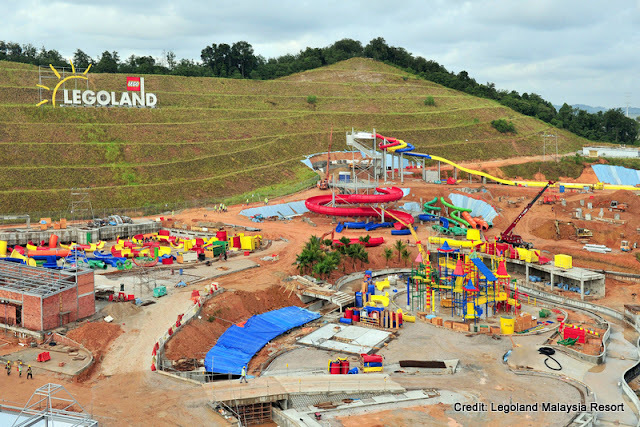 The next phase in the LEGOLAND Malaysia Resort project will see splashing fun being added in the form of the LEGOLAND Water Park. Billed as the LARGEST LEGOLAND Water Park in the world, the interactive and fully LEGO-themed Water Park will offer more than 20 unique slides, as well as over 70 LEGO models among its many attractions and is specially catered to 2-12 year old children. 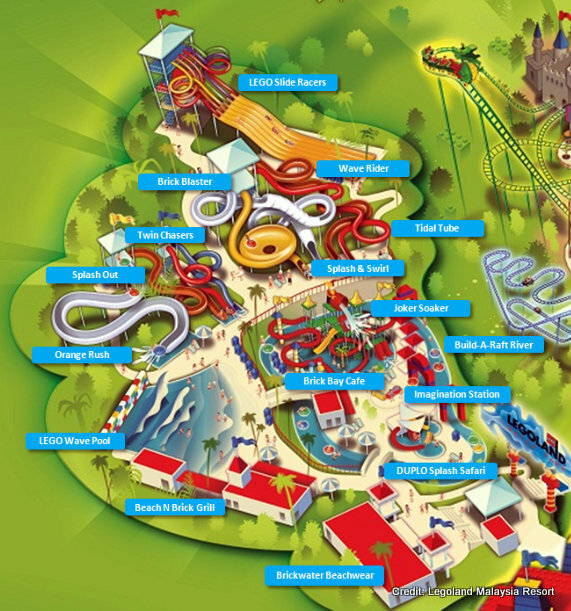 And speaking about attractions, just take a look at the number of water rides and attractions in store. Cue crazy screams from my monkies. 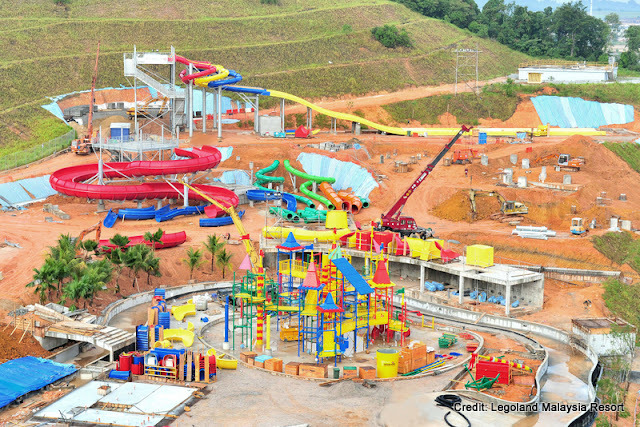 I got a chance to go on a site visit and view the Water Park's construction progress. The Water Park is currently 70% completed, with most of its colourful contraptions in place. Some of the Water Park's highlights include the hugely popular Build-A-Raft River and Joker Soaker. The Build-A-Raft River allows kids to customize their own raft with soft LEGO bricks before floating down a lazy river - I can already foresee this being a huge hit with the monkies. The Joker Soaker is a fun interactive platform in the wade poll where kids can play with water cannons as a LEGO jester model 'tells' jokes while 350 gallons of water cascade down on them. But the ride which I am anticipating the most of all has got to be this. The LEGO Slide Racers allow up to SIX people to race down a slide and see who earns the bragging rights at the bottom. Given my weight, I should be a shoo-in for first place I reckon. Another unique feature of the Water Park is that it is the only one of all the LEGOLAND Water Parks in the world to have 2 entrances - one being the main entrance and the other being connected to the existing LEGOLAND Malaysia theme park. 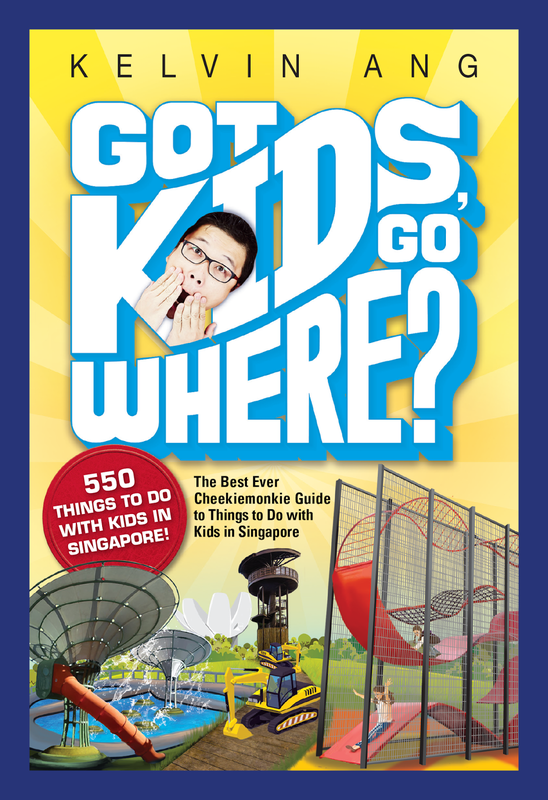 What this means is that it can be enjoyed separately or in combination with the Theme Park. 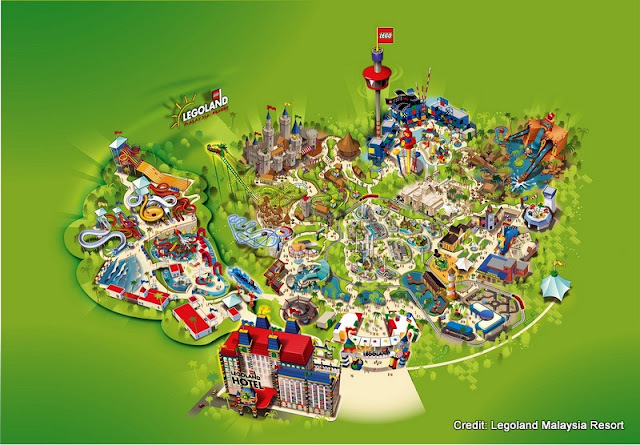 And in case if you are wondering about the LEGOLAND Hotel, it is assembling nicely and on track to open in early 2014 with 249 rooms that are themed to give guests the choice of playing Pirate, commanding a Kingdom or embarking on an Adventure. Can't wait! 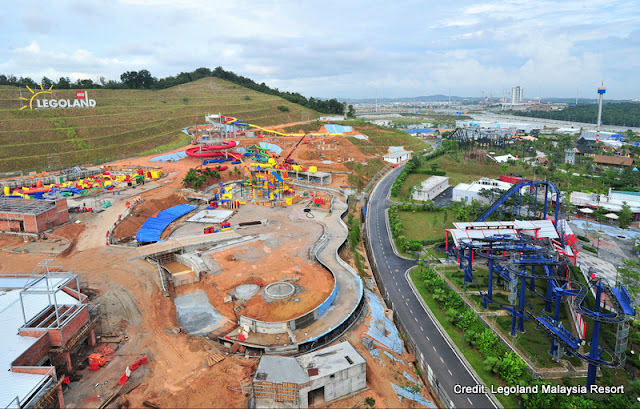 Once completed, the LEGOLAND Malaysia Resort will then be complete with more than 70 hands-on rides, slides, shows and attractions. Premium Annual Passes which offer access to BOTH Theme Park and Water Park will be made available in early August at RM395. Current Annual Pass holders of the Theme Park can also be eligible to upgrade to a Premium Annual Pass or purchase a Day Ticket to the Water Park with a special discount. However, prices for those tickets, standalone Day tickets as well as Annual Passes for the LEGOLAND Water Park will only be announced at a later date. I guess now is a good time to stock up on more sunscreen lotion then.